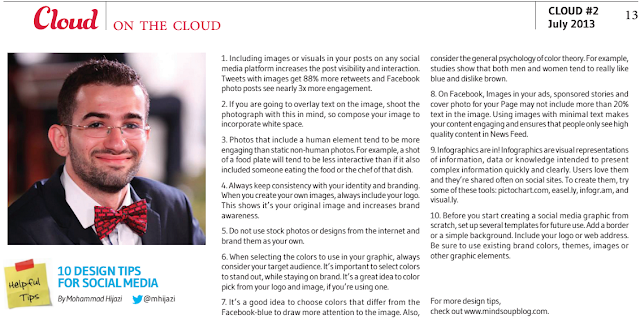 This article was originally published in Cloud 961 July issue. You can download it here (page 13). For more information about Design for Social Media, check out this post. Including images or visuals in your posts on any social media platform increases the post visibility and interaction. Tweets with images get 88% more retweets and Facebook photo posts see nearly 3x more engagement. If you are going to overlay text on the image, shoot the photograph with this in mind, so compose your image to incorporate white space. Photos that include a human element tend to be more engaging than static non-human photos. For example, a shot of a food plate will tend to be less interactive than if it also included someone eating the food or the chef of that dish. Always keep consistency with your identity and branding. When you create your own images, always include your logo. This shows it's your original image and increases brand awareness. Do not use stock photos or designs from the internet and brand them as your own. When selecting the colors to use in your graphic, always consider your target audience. It's important to select colors to stand out, while staying on brand. It's a great idea to color pick from your logo and image, if you're using one. It’s a good idea to choose colors that differ from the Facebook-blue to draw more attention to the image. Also, consider the general psychology of color theory. For example, studies show that both men and women tend to really like blue and dislike brown. On Facebook, Images in your ads, sponsored stories and cover photo for your Page may not include more than 20% text in the image. Using images with minimal text makes your content engaging and ensures that people only see high quality content in News Feed. Infographics are in! Infographics are visual representations of information, data or knowledge intended to present complex information quickly and clearly. Users love them and they’re shared often on social sites. To create them, try some of these tools: pictochart.com, easel.ly, infogr.am, and visual.ly. Before you start creating a social media graphic from scratch, set up several templates for future use. Add a border or a simple background. Include your logo or web address. Be sure to use existing brand colors, themes, images or other graphic elements. 20% text rule in Facebook is gone now! To clarify, the 20% rule is not gone. Any ad or promoted post that includes more that 20% text is still not being approved as Facebook has re-instated this rule (they never removed it according to their costumer service).